Growing up I was known as “The Stroganoff Kid.” The Lipton company had a boxed version of a type of noodles and sauce that I was seriously addicted to. Every Friday when Dad placed an allowance in my out-stretched hand I hopped on my bike in search of a box for $1.85. 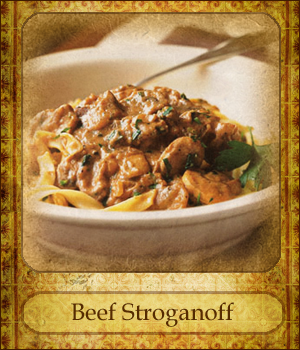 There was nothing in the world I wanted to eat more than Beef Stroganoff. Even on the rare occasion on which my family traveled I would head out for a walk in search of a corner store. Every province catered to this crazy addiction I had. For some bizarre reason my daughter has come down with the same ailment. She must cook a box of Beef Stroganoff any chance that she can. Unfortunately the original Lipton version has changed, but she’s managed to find another version that does her just fine. Because of our crazy love for Beef Stroganoff, I came up with a homemade recipe that’s 10 times better than any package can offer. It’s quite simple, and has definitely been a family favorite for years. Enjoy! Cut 1½ pounds of round steak into bite size pieces, and then roll them in coating mix until each piece is well covered. Brown the beef with ¼ cup of margarine in a large skillet. Add the above ingredients to the beef, and brown lightly. Stir in 1 can of beef consomme. Cook covered on medium heat for 1 hour, stirring often. After a while, add water if needed to keep the mixture from burning. Stir in 1 cup of sour cream. Serve over 3 cups of cooked broad egg noodles. Garnish lightly with parsley flakes. Thanks so much for the ideas. This will be really helpful since I don’t have access to a microwave at work!